Thick hair offers a luxury that no other type of hair can provide – you can style it any way you like. 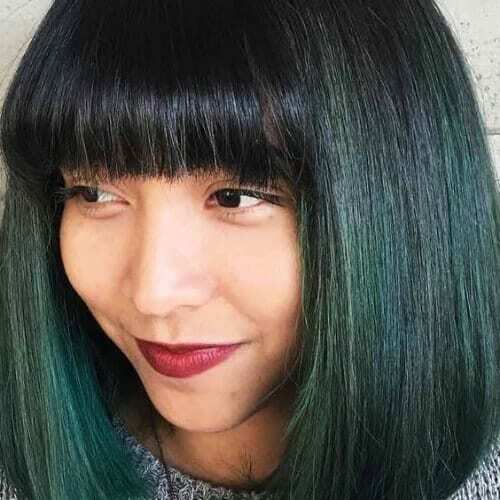 Its wealth and volume mean that you and your stylist can attempt absolutely any hairstyle that crosses your mind from curly bangs to the ever-stylish bob to layered lobs to sleek and elegant styles. Scroll through our selection of 50 timeless medium length haircuts for thick hair and find which one would suit you best. One of the coolest haircuts of the past few seasons has been the bob. 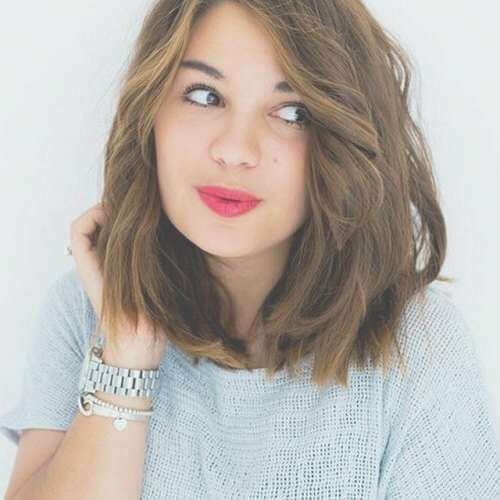 This is a lob or a long bob with a few beach waves in it and jagged or choppy ends. They will help give your thick hair an airy feeling. 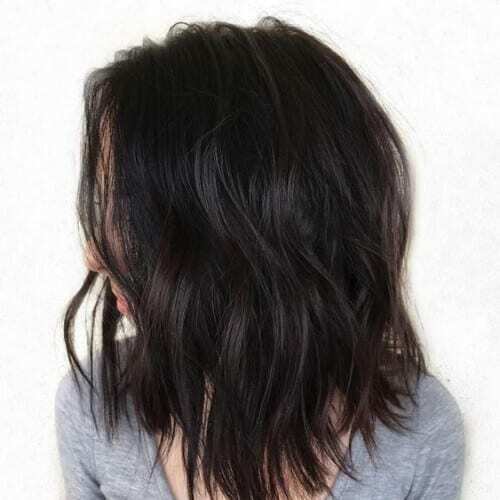 If you have thick hair, a medium length haircut is always the best. 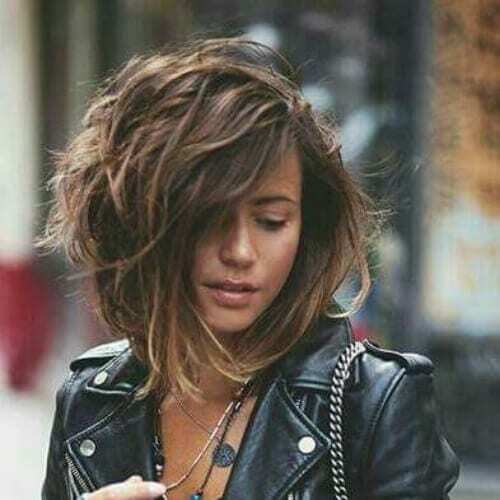 Short hair might deprive you of your beautiful mane while long hair might prove to be somewhat of a burden when it comes to caring for it or managing it. 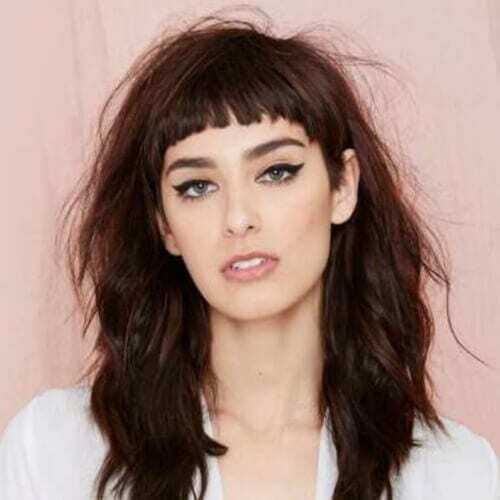 We love this set of asymmetrical bangs and the way they thin around the middle. This little trick will make sure that your eyes get enough attention and that your thick bangs will not overpower them. If you want beach or mermaid waves, all you have to do is braid your hair after you take a shower and sleep on it. You can also use your hair straightener. Just watch a few YouTube tutorials and you’ll get the hang of it. This British songstress has always had very thick and luscious locks. The way she styles her hair has changed a bit now into more demure and slick hairdos, but she will always be remembered for her puffed up glamorous hairstyles. This is the perfect hairstyle for summer in case you have thick hair. It looks as if you’ve just returned from the beach where the salty air and sea breeze have played in your locks all day crunching them up and making them wavy. Actress Jessica Biel is another celebrity who was blessed with thick and lustrous hair. She wears hers in a gorgeous mom bob with volumized curls and just enough blonde highlights to bring her hazel eyes to life. Here is the very definition of bed head. Of course, in order to get it, you will have to use a considerable amount of product and style your hair to look exactly as if you had just woken up and gotten out of bed. This type of bangs was very popular back in the 90s and at the beginning of the 2000s. They are called side bangs that can be parted by either a side part or a middle part, and they are longer than a typical pair of bangs. When your locks have extra body, you’re always looking for low maintenance haircuts for thick hair. This is as simple as they can get. It’s a shoulder-length bob with airy ends, a side part, and twisted side bangs. Another way in which you can tackle that extra volume your hair always seems to have is by getting a V-shaped haircut. As the name suggests, the haircut resemble the letter V in the back, growing thinner and thinner toward the ends. Granted, Queen Bey is, most likely, wearing a weave here, but she still looks like royalty crowned in her own curls as she attends this red carpet event. 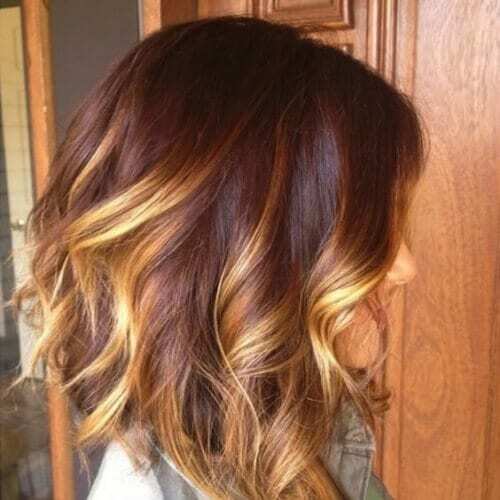 She opted for a two-toned ombre in blonde and brown. 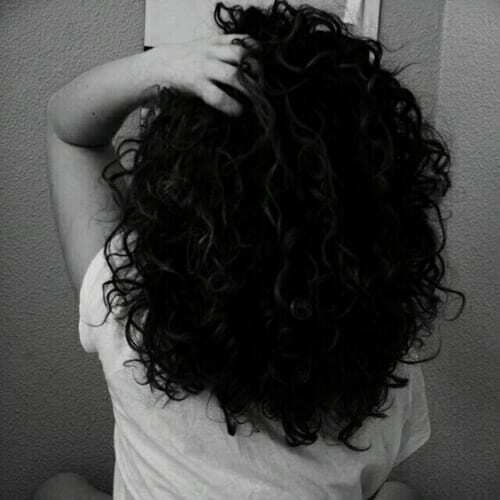 As all curly-haired girls know, there’s nothing thicker than their locks. Although this is a natural occurrence, it is still very high maintenance, requiring regular trips to the stylist and enormous quantities of hair care product. Blonde hair might be a classic choice, but it can surely be jazzed up if you know how to style yourself correctly. Wear some colors that will accentuate the blonde as well as a series of clashing patterns that will help you stand out. Speaking of blonde, how about this sunny shade for your summer days? It’s the perfect color for hot days either in the city or lounging on the beach and taking in the sun with a good book and a cocktail. This combination of mahogany hair with golden highlights should be your go-to solution for fall. It’s also great for medium length haircuts for thick hair because it has enough body to sustain both colors. Bangs are definitely in this season. Therefore, the only question that remains is how will you style them? We suggest you consult your stylist first. 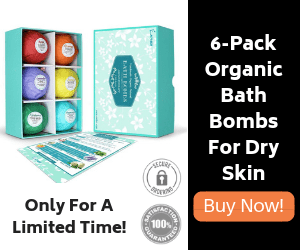 He or she will be able to tell you what works best with your facial type. Her straight and layered bottle blonde hair is the image of perfection. It compliments both the actress’ green eyes and fair skin making her look like a Disney princess. We are also loving the crushed berry lipstick. Seeing as it’s one of her best assets, Kim Kardashian has taken good care of her hair these long years since she’s been a celebrity. Here she is sporting a messy lob with a side part and a gorgeous ethnic necklace. What do you do when you have very thick hair? You get a set of outstanding bangs and ride it out. Medium length haircuts for thick hair have never looked better than they do on the superb Rose Byrne. Another way in which you can cheat is by using an optical illusion. 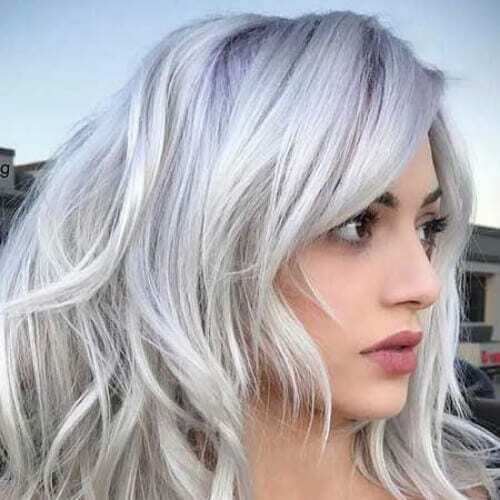 Cold and extreme colors such as arctic blondes and platinum always make it look as if your hair is thinner than it is in real life. Therefore, go ahead and give this idea a try! However, if icy blondes are not your thing and you have a fierier personality, you can always try this copper with amazing red highlights. The effect on your skin and eyes will be mesmerizing, warming them up as if from within. If you don’t have thick enough hair but envy the ladies who do, don’t stress about it. Today, weaves have become so evolved that you literally cannot spot one anymore. Therefore, you can have all the thickness you want with the help of a weave. 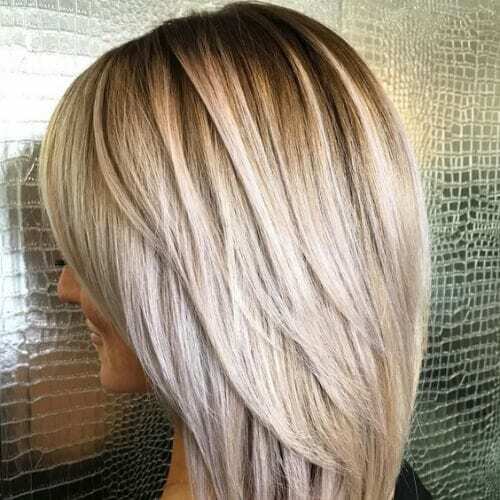 This is a thickly layered bob in a scrumptious blonde shade with caramel highlights and lowlights. The loose and airy layers of the voluminous hair make it possible for you to see that the caramel highlights go deep down to the roots of the hair. This is a medium length sleek bob with a set of heavy bangs that also has a slight greenish overtone. It makes it perfect for both summer and winter because of its freshness and the deepness of the color itself. Nothing can beat the elegance of soft golden blonde waves that fall perfectly onto your shoulders and neck which, incidentally, has also been adorned with a heavy, solid, one-piece gold necklace. Honey brown is one of the colors of the season. As we’ve all seen, the world has slowly shifted toward brown lately and honey brown is just one shade you can enjoy. You can tone up or down the brown depending on the color of your eyes. Speaking of brown, here’s an interesting way of using this color. Actress Sandra Bullock has kept her usual brunette hair but added some milk chocolate highlights into it. It might look a little cacophonous at first, but, in reality, they warm up her features. Drew has always been the bad girl of the 9os with her messy curly hair and her grungy makeup and clothes. And, while she gave all that up after she matured, she still has a wealth of hair which she now dies light copper. Coping with thick hair is also all in the styling. Always go for the appropriate makeup that suits your facial type as well as the color of your hair. You can check out Pinterest boards and Instagram if you need help with this. Another major trend to come out of Instagram lately has been curly bangs. They’re so gorgeous and fantastic if you can pull them off, just like many of your favorite celebrities already have, such as Zendaya and Rihanna. Medium length haircuts for thick hair over 50 need to accommodate whatever type of hair you have, be it coarse or very fine. The first step will be to accept that your hair is going to change a little bit from what you were used to. Actress Zooey Deschanel has one of the best heads of hair in Hollywood. She also has an iconic look, people all over the internet now stating they cannot recognize her without her bangs. Make sure you check it out for yourself! We’re back to browns, the color of the season, only this time it’s this lovely mushroom brown that will surely turn you into the coolest girl around if you wear it. Part your hair on the side and toss in some beach waves for good measure. This songstress’ tresses are so beautiful, famous, and lustrous that she was even chosen to advertise shampoo because of them. Therefore, when it comes to tips on medium length haircuts for thick hair, we will definitely turn to Jennifer Lopez. If you look closely you will notice that Eva Mendez’ hair has a very subtle reddish undertone to it. That’s very clever because she has olive skin and dark coffee colored eyes. The red in her hair will highlight both her complexion and her eyes. We haven’t seen these bangs on a large scale since the 2000s, but that doesn’t mean you can’t wear them. What we said was ‘on large scale.’ This means that the trend is still alive and kicking, and that you can benefit from it. This side ponytail has two strands of hair that have been swooped over to the side and over the ears giving the impression that she has a pair of very long side bangs. We also love the little beehive on top. Here is a dark and gorgeous Katie Holmes teaching us all how to be sultry in a suit and a smoky eye. Her dark chocolate hair is ruffled and messy as if she just got out of bed and came in for the photoshoot. Does anyone bring it like Jennifer Love Hewitt anymore? She was the it girl of the 90s gracing silver screens in romantic comedies and horror movies alike. Her cocoa brown hair matches her eyes perfectly and is beautifully captured by her sequin gold jacket. Here are more celebrity inspired haircuts for thick hair. Another famous brown-haired girl is none other than the future Queen of England herself, Kate Middleton. 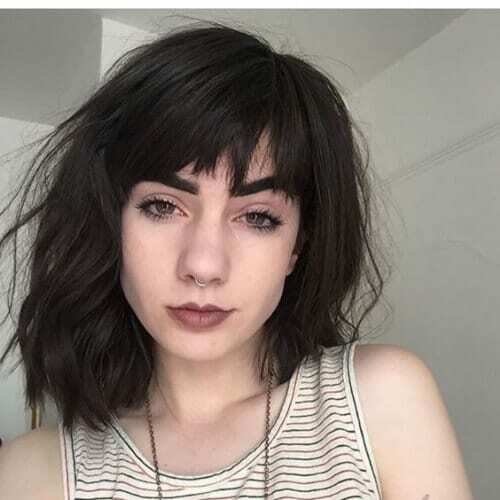 She’s a huge fan of medium length haircuts for thick hair as well, given that she has a lot of volume and bounce in her locks too. But blondes have a lot of fun as well and can bring it to center stage just as good as brown- haired girls. Amanda Seyfried is living proof of that with her glossy and gorgeous layers of hair that seem to go on forever. Let’s face it. You don’t get to be the most followed person on Instagram if you don’t have good hair. It simply doesn’t happen. And Selena’s is fantastic. The light caramel highlights serve to sweeten up her angular face. Everyone’s favorite blonde girl, Kate Upton swears by medium length haircuts for thick hair. Her shaggy, dirty blonde hair helped transform her into the bombshell that she is today. It also helps make her square face a bit more feminine. The frizz is back! That’s right. Get ready to say hello to the 80s once more or for the first time if you weren’t born yet during that decade because the big and frizzy hair with an attitude is making a comeback! The main color of the season is, without a doubt, extreme blonde. You can choose whichever shade you want. The list includes iceberg, arctic blonde, platinum, stardust, and similar shades that look really cool in all seasons. Baby bangs are not easy to wear or style, we’ll give you that. However, they are a fantastic way to thin your hair if you feel that your mane simply cannot be tamed any longer. The shortness of the bangs will make it seem as if you have less hair hanging around your face. Who remembers this 90s goddess? She starred in the teen drama series called Beverly Hills 90210 as Valerie Malone the entire length of that decade, and inspired a whole generation of teenagers with her fashion and style sense. This red bombshell made heads turn on another iconic TV show and in a completely different decade. We’re talking, of course, about Mad Men, set in the 60s, where Christina Hendricks shines along with her medium length haircuts for thick hair. If you have wavy or even slightly curly hair, we suggest you flaunt it in all its glory. Use a bit of styling product to tame those curls but let them bounce free off your shoulders as you enjoy your day in the most casual way possible. 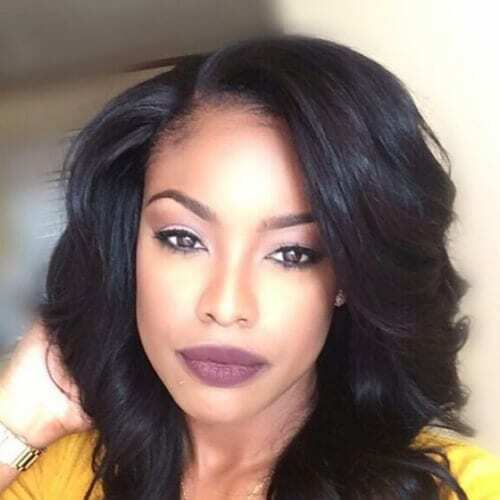 Even though thick hair gives you the possibility of doing anything you want with its wealth and volume, medium haircuts for thick hair are still the best choice. 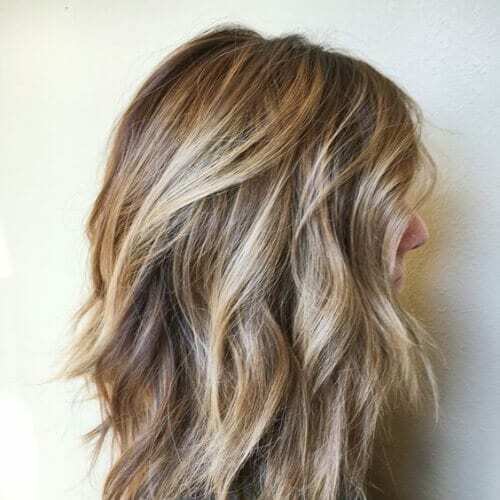 They flaunt your locks and are the simplest way to go in terms of maintenance and planning a budget for visiting your stylist on a regular basis. Write to us in the comment section below and let us know which one was your favorite!